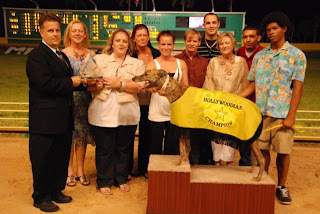 Last week I wrote about the death of Crispins Place, a champion greyhound who died in February after suffering a broken leg at Gulf Greyhound Park in Texas. According to state records, Crispin did not receive veterinary care until two days after his injury, causing him to be subject to "unnecessary suffering." For this "inhumane treatment," trainer Criag Edwards was fined a paltry $500 and not suspended for even a single day. After learning of Crispin's death, we wrote to the Texas Racing Commission to express our disappointment in the handling of this incident, and urged officials to reopen the case and consider handing down a stiffer penalty. We have received a formal response to our letter, which contains information that is both encouraging and worrisome. "Under the Texas Racing Act and the Commission's rules, a decision of the stewards or judges becomes final unless appealed within three days of issuance by the affected licensee. Since Judge's Ruling Gulf 962 was issued on March 18, 2011, it became final on March 21, 2011, when Mr. Edwards did not file an appeal. The Commission therefore no longer has jurisdiction to reopen the case." "On its own motion or on request by the executive secretary, the Commission may reverse a decision of the stewards or racing judges, modify a penalty imposed by the stewards or racing judges, or reinstate a person's license and rescind the penalty." "While all of the agency's stewards and judges are very capable and experienced, the Commission recognized during Sunset reviews that the Texas Racing Act could be improved by providing for additional management oversight of field staff." "While this change would not authorize me to revise past decisions, my ongoing reviews of decisions will be accompanied by the authority to make adjustments where necessary to ensure that the Act and Rules are enforced consistently and effectively." 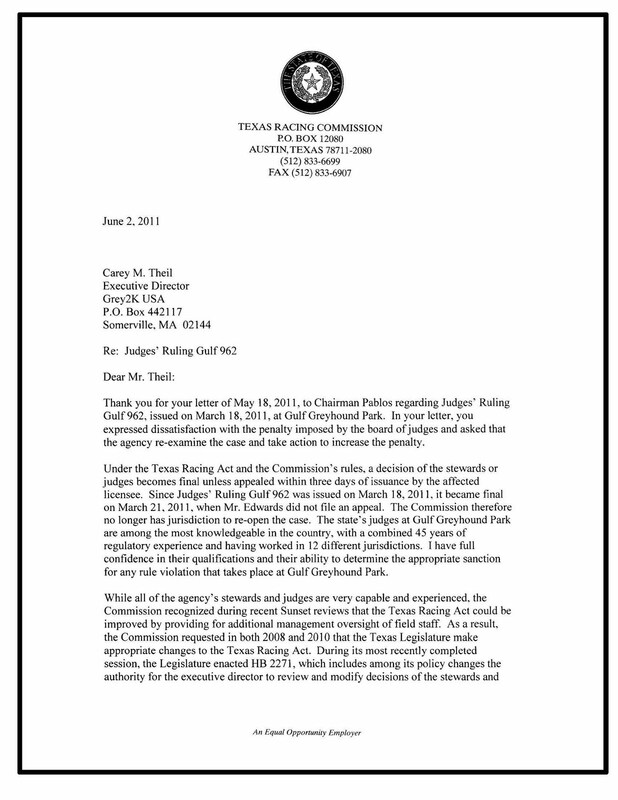 In other words, Trout claims that the Texas Racing Commission does not have the authority now to reopen the case of Crispin's death, (although the Administrative Rules say otherwise), but it will have this authority soon, and the Commission acknowledges they need this authority to make sure the Rules are enforced "consistently and effectively." Despite the fact that the Commission does apparently already have the authority to act in this case, it is good news that the Commission is seeking greater legal powers. It is important that dog track regulators have all of the tools available to do their jobs, and improved oversight will undoubtedly help greyhounds. "With their knowledge and experience, the judges are in the best position to determine the appropriate level of penalty that will both punish the individual and deter future, similar violations by the regulated community." With all due respect, this bizarre set of positions is nothing short of schizophrenic. 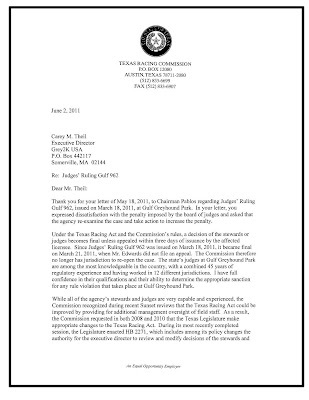 In one paragraph, Trout states that the judges are in the "best position to determine the appropriate level of penalty," while in another paragraph states that the Commission acknowledges the "Texas Racing Act could be improved by providing for additional management oversight of field staff" and has repeatedly asked lawmakers for the authority to overrule the judges. "In this case, the fine imposed by the board of judges is the highest monetary sanction imposed at Gulf Greyhound Park in more than two years." If Mr. Trout and the Texas Racing Commissioners believe this penalty was appropriate, then they are simply out of touch. Here are the facts: a champion greyhound named Crispin Place suffered a catastrophic injury. He did not receive veterinary care until two days later. The Texas Racing Commission officially termed this "inhumane treatment" that caused Crispin "unnecessary suffering." For this "inhumane treatment," greyhound trainer Craig Edwards was fined $500 and not suspended for even a single day. "I have directed the judges to meet with both the kennel and management of Gulf Greyhound Park to verify that veterinary care is readily available at all times and to impress upon all trainers that necessary medical attention may never be delayed for any ill or injured animal. It is my expectation that all parties will take steps to ensure that there is no recurrence of this event." For the greyhounds now racing at Gulf, I hope the "steps" referenced by Mr. Trout are real and concrete. Regardless of how any of us feel about greyhound racing, the "unnecessary suffering" that Crispins Place was subjected to is inexcusable. Unfortunately, the Texas Racing Commission is sending mixed signals about its willingness to address this problem. It is good the Commission is seeking greater authority, and asking the track and kennel operators to take steps to prevent this from happening again. At the same time, its defense of this slap on the wrist penalty sends the message that there really is no substantive punishment for greyhound cruelty in the Lone Star state. I can only hope that things will change over time.